When my husband and I started Capability Homecare back in 2008, I never imagined what an amazing and wonderful journey this would be. Throughout the years I have experienced firsthand the gratitude, joy and relief families have expressed as a result of our caregivers helping their loved ones. It’s been incredible seeing how even just a little bit of help can make all the difference in the world. I can’t tell you how many times we have heard the phrase ‘you guys are lifesavers’! What a wonderful and rewarding career this has been! But now it’s time for me to retire. Last March, Home Care Assistance acquired Capability Homecare- creating the largest home care provider on the Eastside. The Capability team (Director of Operations, HR Manager, Care Manager, Staffing Coordinators and Caregivers) all remain- and have joined with the Home Care Assistance team to change the way the world ages. As for me, it is with heavy heart that I say goodbye. Fortunately, I’m leaving knowing that Capability Homecare (now Home Care Assistance) will continue to provide top notch service to seniors and their families in the Greater Seattle area. Thank you to everyone who has been a part of my journey. I will miss you. If you would like to learn more about Home Care Assistance, click here! And for even more info, check out their blog and a Facebook page! One of the most challenging things about living with someone with Alzheimer’s can be the constant confusion. Often, the person isn’t in touch with reality and may not realize where they are, or what year it is, or who you are- and that can be heartbreaking and frustrating. “No Mom, that’s not Suzie, it’s Karen- your daughter”, or “No Dad, we aren’t going to church today- it’s Wednesday. We don’t go to church on Wednesday”… and so on. Unfortunately, these types of (well intentioned) responses can often illicit an argument- and actually add to the confusion and anxiety that the person is already feeling. I distinctly remember having these exact kind of conversations with my grandmother- she would get confused and when we would try to gently correct her- she would become visibly agitated and sometimes even downright angry. I only wish I had heard of the ‘yes, and’ approach then. 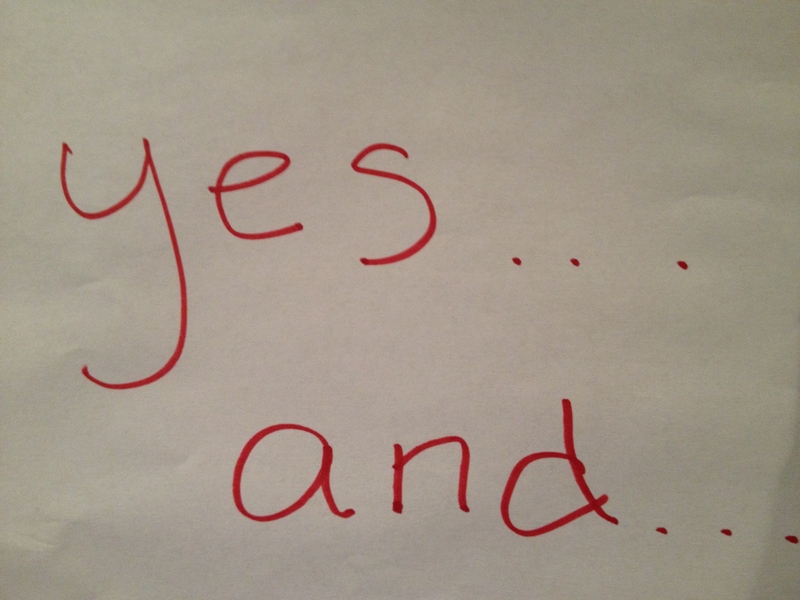 I first heard of the ‘yes, and’ approach on the radio (KUOW). I was driving to work and listening to a story about a comedian who’s mother in law suffered from Alzheimer’s. She was often confused- and sometimes even delusional- but rather than correct her, he used a technique he had learned in an improv class- that of always saying ‘yes, and’ to whatever was thrown at him on stage. “Yes, I see the monkeys, and don’t you think it’s a bit early in the season for monkeys?” Upon hearing this response, she immediately lit up and the two of them went back and forth in a crazy conversation- one that left a lasting impression on both of them. 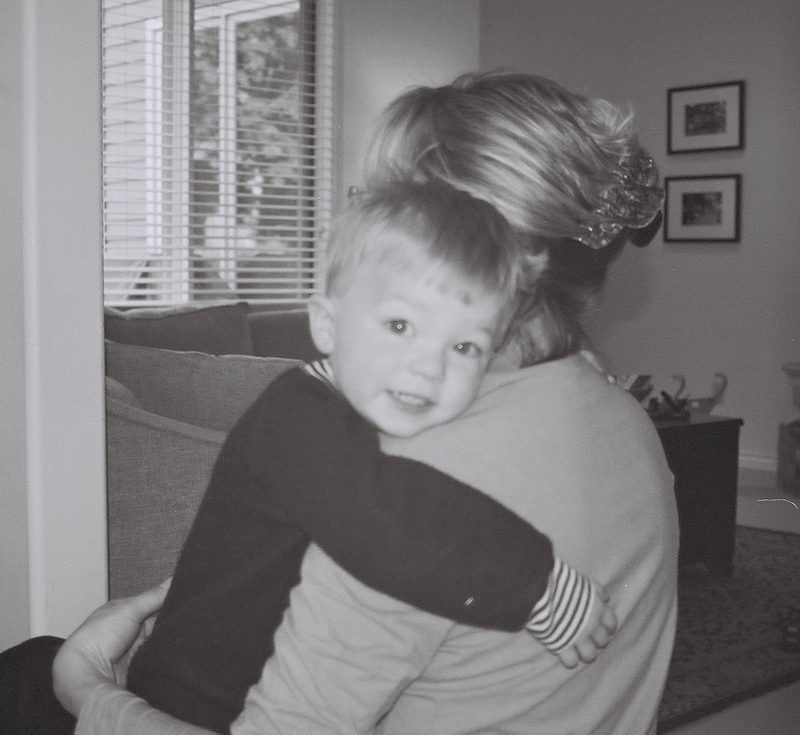 By saying ‘yes, and’ to whatever his mother in law would say- he was engaging her in a conversation (no matter how silly or outrageous) which allowed her to feel connected and in turn, gave her joy. Over time the family began to see that she clearly favored the son in law over anyone else. Her face would light up when he would enter the room and she would get excited to converse with him. They recognized that the change was due to his ability to meet her where she was, and eventually they all adopted the ‘yes, and’ approach. Sometimes it was easy, other times not so much… but it reminds us that by entering into the reality of the person with memory loss- you are giving that person the opportunity to connect with you. That connection and social engagement is far more important than ‘being right’. Through patience, humor and creativity- you can change your interactions with the person you are caring for. Capability Homecare has trained and experienced caregivers who work with Alzheimer’s and Dementia clients daily. The Seattle Walk to End Alzheimer’s is Sept 20th. This is a great opportunity to raise awareness and help fundraise for this terrible disease. Capability Homecare will have a team there this year and we are looking for your support. Please consider joining our team- or donating! If you are interested, click here. Many of you know that my grandmother suffered from Alzheimer’s. Over a short period of time, the disease took over her body and changed her into a stranger. It was heartbreaking for our family to witness. We tried to be patient, tried to not get frustrated that she asked the same question over and over again, and we tried to calm her fears by keeping things familiar for her. Eventually, her disease progressed to the point that it was more than we could manage and we needed to find help. In home care is a great option for someone who suffers from Alzheimer’s. Being surrounded by things that are familiar and comfortable can help reduce the stress and anxiety caused by memory loss. Capability Homecare offers live in or hourly care to help families keep their loved ones safe at home. I immediately thought of my grandmother, who had Alzheimer’s disease, and how that would have been absolutely perfect for her. 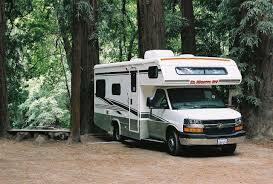 One of her favorite things to do was to go camping. She and my grandfather owned a lot at Clearwood and every summer we would spend a week surrounded by the gorgeous pine trees, lovely lakes and endless trails. We would sleep in the RV- but most of our time was spent outdoors- hiking, swimming, exploring and making s’more by the fire. These were really happy times- and as I reflect back on them I realize how blessed we were to have had those experiences. I also realize that as my grandmother’s memory slipped away- reminiscing about those days of camping would have probably brought her lots of joy. It would have sparked memories of happy times we had as a family, like the time we found the rock that looked like a baked potato and we put it on my grandpa’s plate that night at dinner! He, with a twinkle in his eye, went along with the joke and pretended to try to eat it. As children we were delighted with this silly prank- yet it had slipped to the back of our minds and was forgotten. The visual cues of the camping scene at Aegis Living at Marymoor would undoubtedly bring out these memories- and many more. Knowing that my grandmother could have enjoyed the comfort and safety of the gated back yard while reminiscing about a very special time in her life makes me smile. Knowing there are communities like this makes me glad that there are so many more options for people with Alzheimer’s than there were 10 years ago. If you need exceptional care for a senior in the privacy of your own home- then Capability Homecare is here for you, but if an Assisted Living Community is a better fit, than know that there are lots of wonderful options for you. 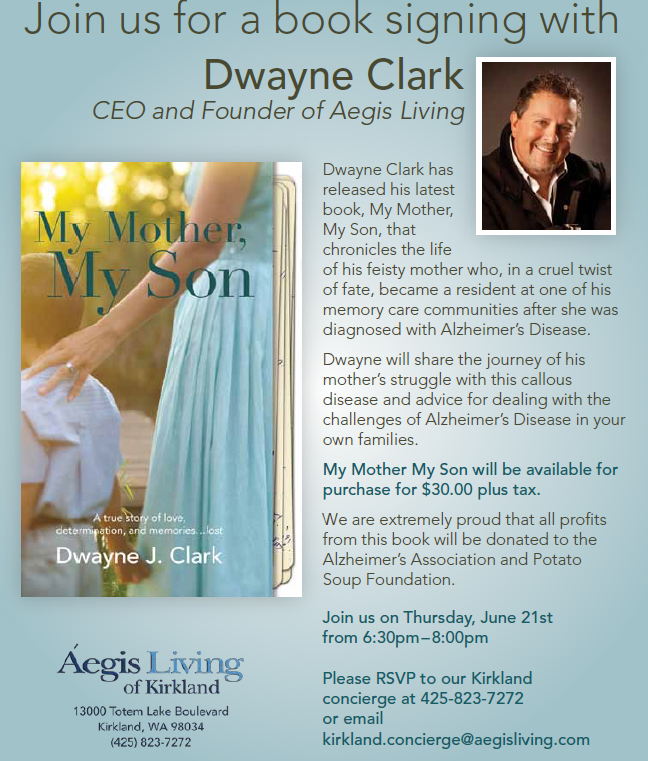 One of my favorite senior communities, Aegis Living, is hosting a book signing- and I wanted to pass on this information, in case you’d like to attend. Please be sure to RSVP! My co-worker’s son is joining the navy next week. It is heartbreaking, yet she is extremely proud of him for wanting to serve his country. As much as she doesn’t want him to leave- she knows it is in his best interest. Although it’s tough, she must let him go. Today I dropped my son off at camp and he cried and begged me to not make him stay. He wept in my arms, his face flushed with tears and his body physically shaking. I had to make one of the hardest parenting decisions I’ve made in a long time. I had to get into the car and drive away, leaving him behind. My heart aching with sorrow. Why he didn’t want to go to camp is beyond me- but I knew that it is in his best interest to go. It’s basketball camp for heavens sake- he loves basketball, he’s trying out for team in the fall and needs the practice, so what I was doing was out of love- but it still hurt. As a parent we have to make tough choices, we have to look beyond what is in front of us and make a decision knowing what is best for our loved one. Many of us find we are now in the position of caring for our elderly parents as well as our own children. Sometimes this requires that we have to make tough choices. We have to use tough love. It reminds me of when my mom brought my grandmother to her new home, a lovely memory care community that could assist with her Alzheimer’s. My grandmother wept, begged and pleaded my mom to not leave. My mom’s heart broke and she cried the entire way home, yet she knew she was doing the right thing. 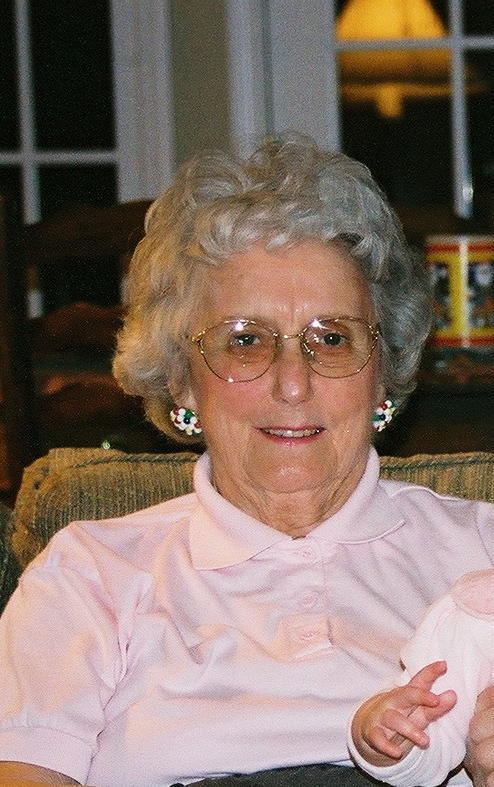 We knew that my grandmother’s disease had progressed where she wasn’t safe at home any longer. * It was a difficult choice, yet for the best. To me, being able to make those difficult decisions- based out of love- is what makes me a good parent. So whether your loved one is joining the navy, or needs more care than you are able to provide, or even if you are just dropping your child off at summer camp- if in your heart you know it’s for the best- be proud of yourself for being strong enough to do what’s right. If you have been in a similar situation, please take a minute to share your experiences. Talking with friends and getting support is so helpful. We can all feel comfort in knowing that we are not alone. *For reasons why we didn’t hire in-home care, see my blog titled ‘Why We Provide In-home Care’.